Shortly after Louis Daguerre presented the results of his pioneering photographic work to the world in 1839, the daguerreotype appeared to stand alone as a unique technological achievement. It seemed to address the primary concerns of the photographic experimenters of the time; to capture real-world images using a relatively short exposure time; to yield an image of acceptable resolution and aesthetic value; and to create an image demonstrating a fade-free permanence. That the daguerreotype did all this so well, with no legal or patent restrictions on the practitioner, it was no wonder that the process quickly found a near fanatical following throughout the world. Before the formal unveiling of Daguerre’s achievements in August 1839, word had begun to spread throughout Europe that the Frenchman had succeeded in developing an innovative method of recording camera images. 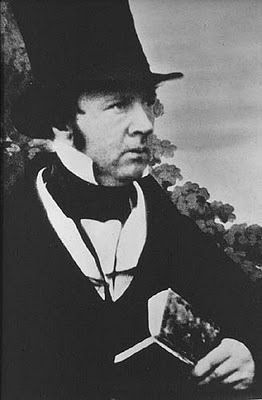 These rumors prompted an English scientist and mathematician, William Henry Fox Talbot (1800-1877), to hurriedly present the details of his independently developed process to the Royal Society in January and February 1839. Unaware of each other’s efforts, both Daguerre and Talbot had been simultaneously working to solve the early riddles of photography. While it turned out that each man had taken decidedly different technical approaches to the problem, Talbot had naturally assumed that Daguerre’s method mirrored his own, and he was attempting to establish a claim to priority. Talbot was born into an affluent family, was educated at Trinity College, Cambridge, and was, in fact, a Renaissance man of sorts: his interests spanned the fields of mathematics, chemistry, astronomy, botany, philosophy, philology, Egyptology, classical literature, and art history, and in addition he served as an elected Liberal member of Parliament in the House of Commons. He published four books and 27 scholarly papers on varied topics, and was a fellow of the Astronomical, Linnean, and Royal Societies. In 1834, after experiencing disappointing results while trying to use a camera lucida (an optical device employing a prism that superimposed an image on a page for an artist to trace), Talbot began to experiment with methods to permanently capture images on paper. Following the initial efforts of Thomas Wedgewood and John Herschel in this field, Talbot soon found that a sheet of fine writing paper, coated with a wash of sodium chloride (salt) and a wash of silver nitrate, would darken when exposed to sunlight, and that a second coating of potassium iodide or salt would prevent further darkening. 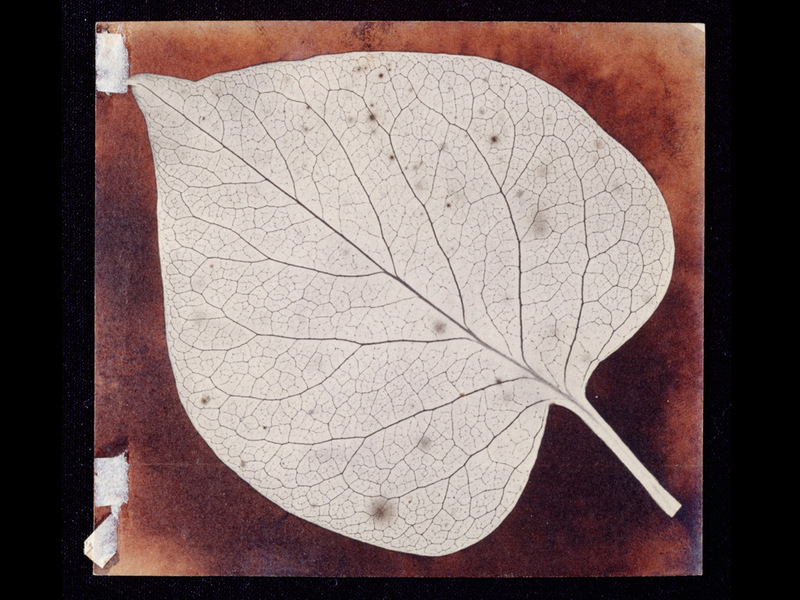 He developed a process wherein he could take objects such as plant leaves or lace fabric, pressed against sensitized paper under a sheet of glass, and then expose the paper to light. Those areas of the page blocked by the object would remain white on the sheet while those exposed to the light would darken. This was a printing-out process — the paper had to be exposed to light until the image was fully visible, which might take an hour or more. Talbot called the resulting images “photogenic drawings,” what we today call photograms. As he improved his chemical processes, Talbot turned in 1835 to capturing images with a camera, but these still employed the printing-out process, demanding long exposure times to realize fully formed images on the paper. While the term had not yet been invented, these were the first “negatives” — the images captured were reversed spatially and in tonality from the natural world. These completed negatives could then be placed against a second sensitized paper and again exposed to light, yielding a contact print exhibiting natural tonality. 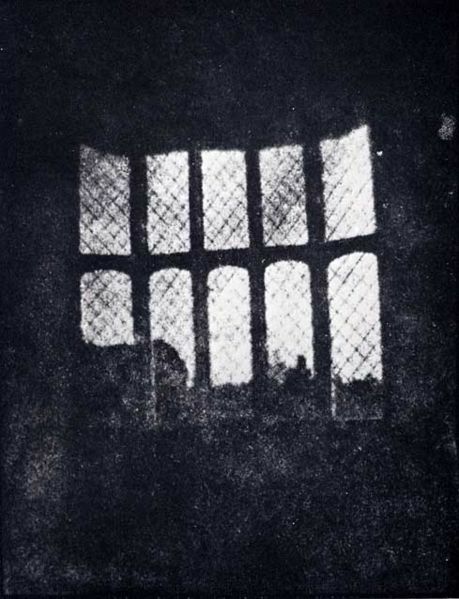 The oldest known example of this was a one-square inch image of his ancestral home, Lacock Abbey – this was the first negative, although it is uncertain whether Talbot actually made a positive print from it at this time. At this point, other interests diverted Talbot’s attention, and little other progress was made until Daguerre’s revelatory announcement in 1839. 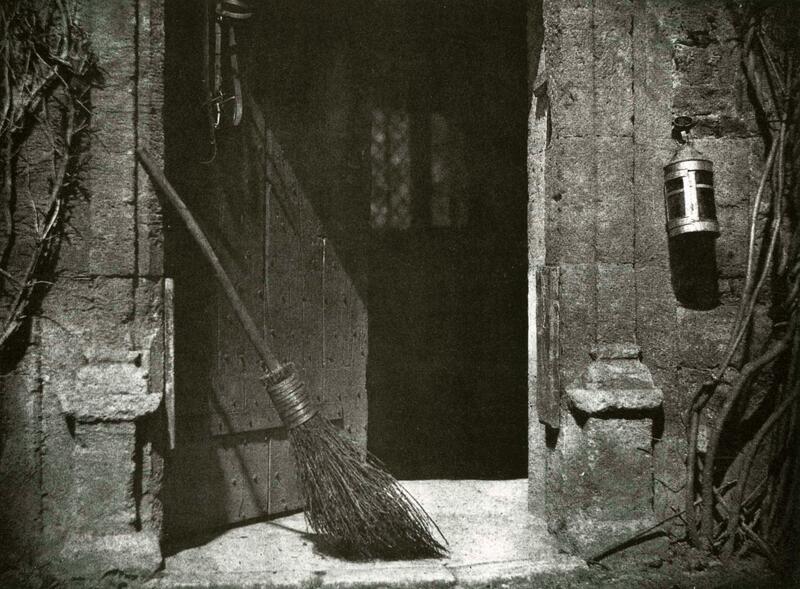 When the details and image quality of the daguerreotype process became known, Talbot quickly perceived the shortcomings of his methods up to that time. Talbot accordingly dove back into his work, and by 1841 had made significant advancements in his processes. A key discovery he made in September 1840 was that an exposure of just a few seconds left a hidden, or latent, image on the sensitized paper, even though no visible image could yet be seen. Further, the application of what he termed an “exciting liquid” could bring out, or “develop” the latent image. This “exciting liquid,” what we would today call a developer, consisted of a gallo-nitrate of silver solution, comprising a mix of silver nitrate, acetic acid, and gallic acid. When the development using this solution was complete, the paper was rinsed and blotted, and then could be stabilized by washing it in a solution of potassium bromide which converted the remaining silver iodide to silver bromide, which would only darken slightly upon subsequent exposure to light. Ultimately, Talbot came to a “fixing” solution, by bathing the image in a hot solution of sodium thiosulfate, then called hyposulfite of soda, or “hypo”; this fixer dissolved the remaining silver iodide in the paper and allowed it to be washed out, leaving the image completely insensitive to further light exposure. Thus, Talbot had come to a developing-out solution that allowed one to capture a latent image in a camera on sensitized paper, using a relatively short exposure time, and then to produce a paper negative via a chemical development process. A key advantage this process offered was the ability to use the negative to make multiple positive prints of the image. In contrast, his competitor’s sharply detailed daguerreotypes were unique positive originals, and could only be reproduced by taking another picture of an original plate. In early 1841 Talbot formally introduced his process, which he called the calotype process, or alternatively the talbotype process, and subsequently patented it. The calotype and the daguerreotype were actually quite similar systems chemically, differing mainly in the support material for the image. Where the daguerreotype used a silver-coated metal plate to capture an image, the calotype used silver-sensitized paper. The translucent quality offered by the calotype’s paper negative (which could be enhanced by waxing or oiling the paper to make it more transparent) allowed it to be used to make multiple contact prints on salted paper, a feature the daguerreotype could not match. However, where the daguerreotype featured extremely sharp image detail, the calotype yielded a softer, less sharp image, dependent on the quality and fiber characteristics of the paper used. While some 19th-century artists considered the look of the calotype as more atmospheric or pictorial, others derided it as grainy and blurred when compared to the daguerreotype. These technical differences, combined with the patent licenses and restrictions that Talbot stubbornly attempted to enforce, resulted in generally a wider public preference for the daguerreotype process versus the calotype, and less commercial interest. In 1844, Talbot launched a major advertising campaign, opening the Reading Establishment to promote the calotype, emphasizing its advantages over the daguerreotype in its capability to mass-produce prints, or to provide print reproductions for book illustrations. Between 1844 and 1846, the Reading Establishment published The Pencil of Nature, a book featuring 24 calotype prints, each pasted in by hand; this book, describing the development, practice, and art of the calotype process, was the first book in history illustrated with photographs. The book was printed in installments, each section delivered as they were completed in the form of loose unbound pages; it was typical at this time for books to be delivered in this manner with the buyer arranging for them to be bound. While critically acclaimed, the book was not a great commercial success; many installments were originally planned, but the project was halted after only six were completed. Only 15 original copies of this 1844-1846 edition are known to exist. The lifespan of the calotype process, as well as that of its main competitor, the daguerreotype, was relatively short. These were the foundational technologies that made photographic endeavor practical, but they were relatively unrefined and constantly evolving as the body of knowledge expanded. While imperfect in its execution, the calotype established the principles of negative-positive image creation that have characterized analog photography though its evolution to the latest advanced film-based emulsions of today. Where the photographer of 1850 would have had to choose between the sharp image quality of the daguerreotype and the reproducibility offered by the calotype negative, in just another year an innovation that merged these qualities quickly eclipsed both the daguerreotype and the calotype. This is the third installment of an ongoing series on the history and development of the art of photography. It is inspired by the History of Photography class taught by Professor Jeff Curto in the College of DuPage Photography Program. While not a slavish copy of his work, I freely admit to following his general course outline and sharing many of the perspectives he has developed. I would encourage anyone with a greater interest in this subject to follow his course online via video podcasts, at http://photohistory.jeffcurto.com.